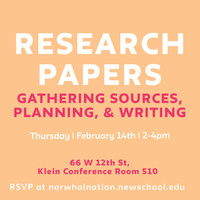 Join us for this workshop where we will discuss the research process: gathering sources, planning, and writing. We will cover strategies for locating, distinguishing, and evaluating relevant sources, as well as organizing bibliographies. We’ll also cover best methods for putting your research into writing. Students are encouraged to bring works-in-progress.